This Friday the 27th of October the W&J Choir, Camerata Singers, and Jaybirds will be preforming at 7:30 in the Rossin Ballroom. 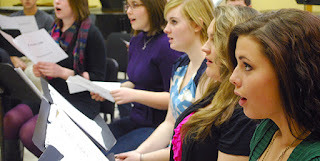 The Choir and Camerata will be doing a show based on "Poetry and Music" as a concept. The performance will wed great poetry and choral music, there will be readings of Shakespeare, Teasdale,Whitman, and more! Then you will hear the music inspired by those poets, how the musicians transformed the ideas, emotions, and beauty into song form! It is going to be a great night to support the arts at W&J!